NEWTON, Mass., May 1, 2018 – Siamab Therapeutics, Inc., a biopharmaceutical company developing novel glycan-targeted cancer therapeutics, today announced the publication of new preclinical data for its ST1 antibody drug conjugate (ADC) targeting the tumor-associated carbohydrate antigen (TACA) Sialyl-Tn (STn). STn is present on multiple solid tumors and is associated with a chemoresistant population in ovarian cancer. The findings show that ST1-ADC selectively inhibits tumor cell proliferation and induces tumor cell death in both in vitro and in vivo ovarian cancer models. ST1, Siamab's lead program, is in late stage preclinical development for the treatment of STn-expressing solid tumors. The data, generated through a collaboration with Bo Rueda, Ph.D., Director of The Vincent Center for Reproductive Biology at Massachusetts General Hospital, have been published online in the journal Oncotarget. The published study results show that STn is expressed on ovarian cancer cells and is frequently co-expressed with the established ovarian cancer stem cell (CSC) marker CD133. Importantly, STn positive and CD133 positive cells persist following cytotoxic chemotherapy. Furthermore, the results show that treatment with Siamab's ST1 ADCs reduced the viability of STn positive ovarian cancer cell lines in vitro and reduced tumor volume in vivo in an ovarian cancer xenograft mouse model, depleting STn positive tumor cells. No significant changes in mouse weight were observed during treatment and no other toxicities were noted. "These findings are important as they hold promise for the development of new therapeutic options to treat ovarian cancer," said Jeff Behrens, president and chief executive officer of Siamab. "The results show that targeting the STn antigen expressed on ovarian tumor cells and, critically, chemoresistant cells, with an anti-STn ADC can selectively inhibit tumor cell proliferation and induce tumor cell death in both in vitro and in vivo models. Furthermore, the studies suggest that either combination or sequential coupling of anti-STn therapy with conventional cytotoxic chemotherapy could target both bulk tumor and chemoresistant cells that play an important role in disease recurrence." Ovarian cancer is the most lethal gynecologic cancer, with more than 22,400 diagnoses and over 14,000 deaths projected in 2018.1 This is due primarily to the lack of reliable early detection methods, resulting in greater than 75% of patients presenting with advanced stage disease. Unfortunately, despite aggressive surgery and adjuvant platinum-based chemotherapy with taxane, which is the standard of care2, most women with ovarian cancer develop recurrent disease that is ineffectively treated with current therapies. these cells and ultimately provide clinical impact by reducing disease recurrence. Data from this study suggest a potential role for highly specific, glycan-targeted therapy in ovarian cancer treatment." Siamab's proprietary technology platform enables the development of highly specific monoclonal antibody (mAb) therapeutics, including ADCs, targeting cancer cell surface glycans called TACAs. TACAs are an emerging set of tumor-specific antigens implicated in immune suppression, chemoresistance and a CSC phenotype. The presence of STn on tumors is associated with metastatic disease, poor prognosis, and reduced overall survival. 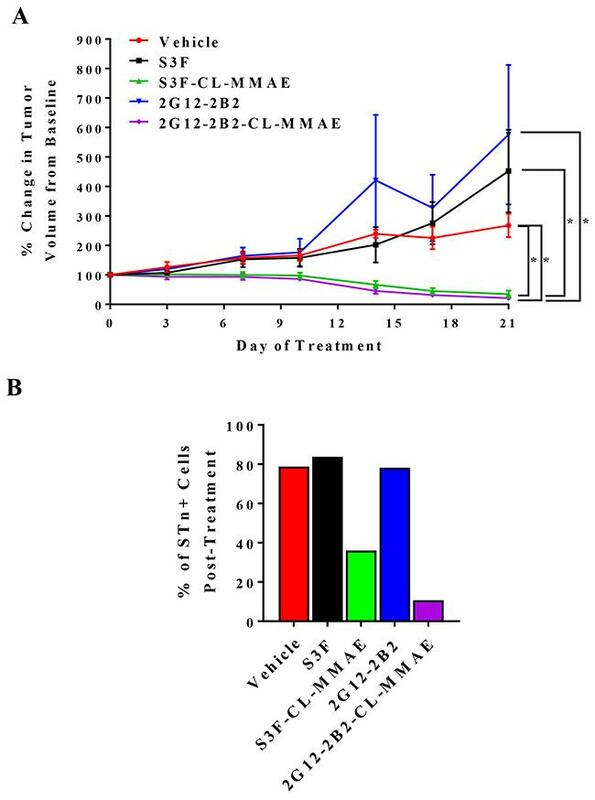 The paper entitled, "Treatment of ovarian cancer by targeting the tumor stem cell-associated carbohydrate antigen, Sialyl-Thomsen-nouveau," can be found online on the Oncotarget website. Siamab Therapeutics, Inc. is a biopharmaceutical company developing novel cancer therapeutics targeting cancer-specific carbohydrate antigens seen on multiple solid tumors. Siamab's proprietary platform enables the rapid discovery and development of therapeutic antibodies that bind with unprecedented specificity and affinity to the novel class of carbohydrate antigens present on cancer cells called tumor-associated carbohydrate antigens (TACAs). TACAs are exciting cancer targets due to their cancer specificity, association with a chemoresistant phenotype, and ability to suppress immune function in solid tumors. The company's lead program, ST1, targets Sialyl-Tn (STn), a tumor specific antigen expressed on multiple solid tumors including ovarian, gastric, colon, prostate, pancreatic and lung cancers. ST1 is in late-stage preclinical studies for the treatment of solid tumors. Visit http://www.siamab.com to learn more about the company. 1. Siegel RL, Miller KD, Jemal A. Cancer statistics, 2018. CA Cancer J Clin. 2018; 68:7-30. doi: 10.3322/caac.21442. 2. Hodeib M, Eskander RN, Bristow RE. New paradigms in the surgical and adjuvant treatment of ovarian cancer. Minerva Ginecol. 2014; 66: 179-92.